Spotlight on: Buckinghamshire! | Home County Candle Co.
Scrumping - as children my sisters and I would always love to go blackberry picking and our favourite haunt was the walk up to Coombe Hill monument, part of the stunning Chiltern Hills. With a Grandad who was an avid jam-maker we had to keep up his production line somehow! Picniccing - again, a fond childhood memory, and still one of our favourite Summer pastimes. Our favourite spots include Wendover Woods (if you’re feeling adventurous they even have a Go Ape! high wire course! ), Burnham Beeches and Stowe. Eating out - Bucks is blessed with some truly amazing restaurants, and when we’re not spending our evenings and weekends in the studio we love nothing more than stuffing our faces with delicious food (and the odd glass of wine whilst we’re at it!). Our favourite restaurants in Buckinghamshire include The Hand and Flowers, Marlow, Humpry’s Restaurant at Stoke Park and for the best Sunday Roast in Bucks it’s got to be The Pointer in Brill! Our ‘The Buckinghamshire’ candle & reed diffuser are beautifully scented with Cedar and Wild Berries, inspired by childhood blackberry picking on the Chiltern Hills. As soon as it came to creating our Buckinghamshire scent I knew it should transport me back to those days picking blackberries with my sisters, and I can honestly say that the fresh, leafy but fruit fragrance does just that! 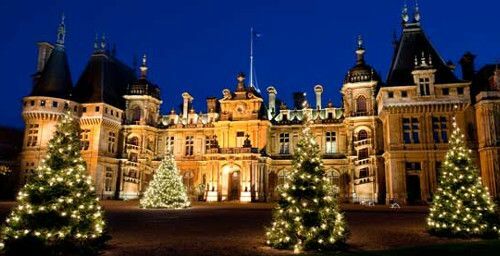 - Waddesdon Manor Christmas Market - Wed. 28th Nov. - Sun. 2nd Dec.